Click here to buy my very popular 2006 CD Cloudwalker. Native American flute, Hang, some vocals. 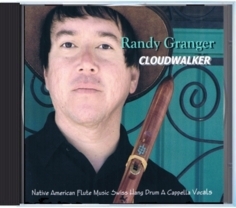 Classic and original songs interpreted on Native flutes by master flute player Randy Granger. Buy an actual shrink wrapped retail CD from my on-line service at Kunaki.